The content on a website is one of the most important things you should optimize if you want to let search engines and visitors know about you or about your business. Thanks to the information that the content provides, the search engine understands what your site is all about and shows this information in the results for the relevant keywords. It is really important to have all settings set up perfectly, because you need to persuade visitors to click on the result of your eshop, magazine or blog. Let’s talk about how easily you can check whether you have the correct content settings on your webpages with the Spotibo tool. In this tutorial, I’ll show you how to detect the biggest content issues. As you are focused to do the content analysis of web pages only, click on the “Web pages” button in the left section. 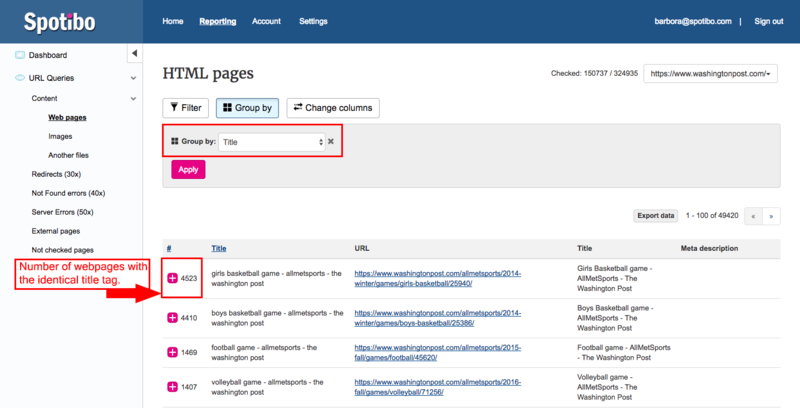 Next, you can check the content issues very easily via the button by choosing the elements you want to analyze. Are the titles correctly formatted? Are the title lengths okay? Are the subtitles relevant and eye-catching? The title is the most important tag you need to have set up properly because, by its definition, you let the search engines know what your site is all about. It’s also the very first information in the search engines that your potential visitors or readers see while browsing. In the button, select options “Title” and “Title Length” and click “Apply”. You need to create a unique caption for each webpage that accurately describes the webpage. The length of each title should be under 60 characters. That way, at least 90% of the title will be visible in the search engine results. How does it look in the SERPs? Google doesn’t show it all. A reader browsing in a search engine has no idea what this article is about. This could cause a lower click-through rate. 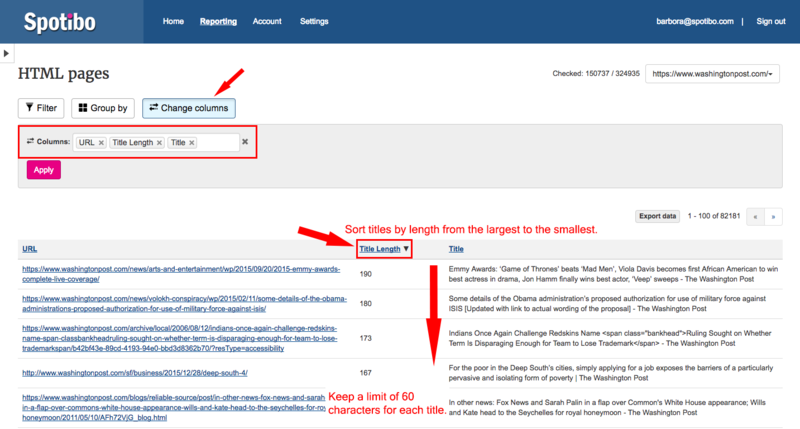 If you want to find pages with missing, duplicate titles or titles not having an optimal length, we’ve written a more comprehensive guide on titles. Is there a suitable description for each subpage that describes its main idea? Is the description length okay? Meta descriptions are attributes that provide summaries of web pages. They commonly appear in a search engine results page (SERP). In select “Meta Description” and “Meta Description Length”. Include the content of the page that attracts the attention of the person browsing in the search engine. In general, the meta description should be under 155 characters long. Otherwise, it will probably not be shown as a whole description in search engines. So how does it look if the meta description is too long? Google just cuts it off, so if you want to write something important in that description, nobody will get to see it in its entirety.  In this case, the same rule applies as for the title. This could also cause a lower click-through rate. We’ve also written for you a guide on meta descriptions that are too short, too long, missing or duplicate. Is there an <h1> tag set for the main heading? Headlines help visitors and search engines to understand the structure of the page and to orientate better on it. In select options “Count of H1” and “All Headings”. The main <h1> heading tag is followed by the other heading tags <h2>, <h3> and <h4>, which provide the structure of page logic for search engines and basic users, as well as for those who are disabled. Look at this example of a blog article. Check it out on your own on the Washington Post’s website. Do you think there is any sense in the heading structure? I think it could be done in a different way. This blog post is about one topic, so only the main heading “Why Greece and Germany just don’t get along” should be tagged with the <h1> tag. Other subheadings should be tagged as <h2>, <h3> and lower because they just follow the main heading and expand the topic. Check how to find issues with headings in our more comprehensive tutorial on headings. Are the images accurately described? Do duplicate images appear on the website? Are there huge images on the website which take too much time to load? We’ve already written a detailed tutorial about SEO image analysis. Continue reading more in the article How to do an SEO image analysis. In case you want to analyze large websites, I have a few more tips for you. You can use our filtering and grouping options, which can make lots of things easier for you. For deeper analyzing and filtering of individual sites or sites with similar characteristics, you can use the button. 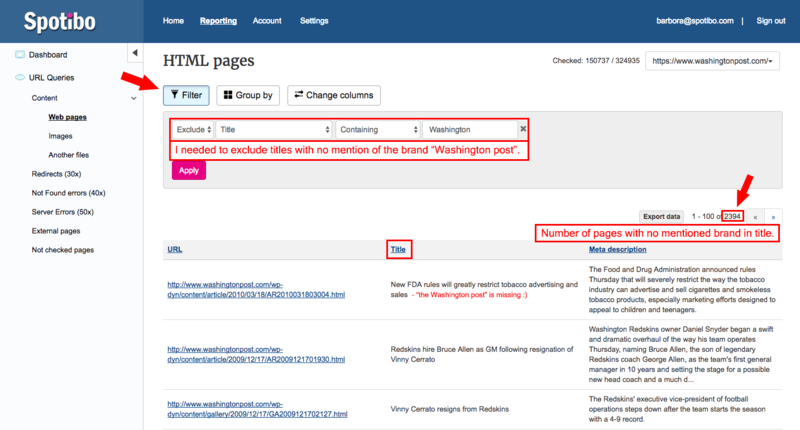 Try different variations to filter URL, titles, meta descriptions or headings however you need them. A very important element of a title tag is the brand of a magazine or a company, so people can see at a first glance in the SERPs which website they are clicking on. Do all your web pages have brands in the titles? Let`s find out! Do you need to analyze web pages that are only containing video content? Do you use /video/ tags in the URLs? This can be easily done. Do you need to analyze a large website containing hundreds of different sites? No problem. For an easy method, you can group them via the button . This function can be used for displaying the most frequently repeated duplicated titles. Try analyzing content on your own web. If you are more curious about how to optimize content settings of a small website, read a quick SEO analysis case study of our website. Check out the 11-point checklist and try to analyze your own website step by step with me. SEO is constantly evolving, there is no doubt. However, the most important rules do not change. You will do very well if you stick with the instructions from the 2010 Google Guide. How to do an SEO image analysis?